What do you suppose it would take for this crafty old bat to snap out of her unplugged stupor and get back to blogging? 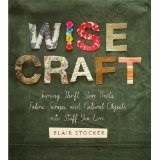 Turns out it's this right-up-my-alley new book by Blair Stocker called Wise Craft. When I first flipped through my review copy I literally jumped up out of my chair looking for someone to show it to. I felt it must have been written by one of the regulars at my local thrift store; I felt akin to her simple whimsy and most of all, I knew I could do most of the projects! The book moves through the seasons with whiffs and hints of the old ways, when we still darned socks and ground our own...everything! I'm excited about decorating thrift store china, and I can't wait to cut those strips of felt and whatnot into spiraling fringe-y flowers. These are the kinds of projects I actually have time for. Now, the instructions aren't highly detailed -- usually two to three pages for each project -- but the occasional extra illustrations are in just the right places. You probably have most of the supplies already, and the tools, aka "Crafter's Toolkit" are simple and readily available. There are even a few tools I haven't played with much, like china markers and spray paint. The simplicity of the items leaves lots of space for creative improvisation -- I'd love to embroider the leather with seed beads before stitching it around the rocks. I think folks who are already adept at crochet and other fiber arts would be inspired to innovation, too. Grade: A for inspiration and cuddle-by-the-fire factor.